Today's card features a stamp and tag from Hampton Arts! Make 4.25” x 5.5” base from lavendar cardstock. Cut and adhere 4” x 5.25” PP panel. Stamp sentiment with red ink. 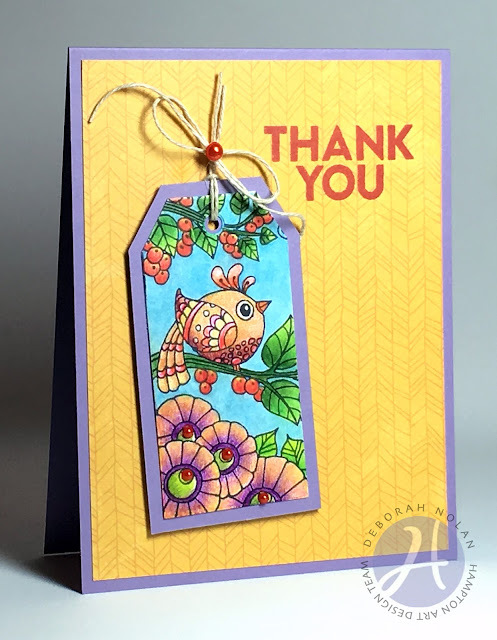 Stamp tag and color image with pencils. Adhere tag to lavender cardstock and trim for matte; punch hole in center. Thread matted tag with hemp; tie tails with second piece of hemp. Adhere tag to card with foam dimensional tape. Color pearls with Copic marker and adhere once dry.